This is the officially licensed Gran Turismo edition of the popular Thrustmaster T300RS wheel! Good stories never end: after the success of the T300RS, Thrustmaster and Gran Turismo join strength again to offer gamers a realistic, powerful driving experience, with no compromises: Thrustmaster T300RS GT! This special GT edition of the T300RS shows a new look of the detachable GT Style wheel and pedal set, for the real Gran Turismo fans! 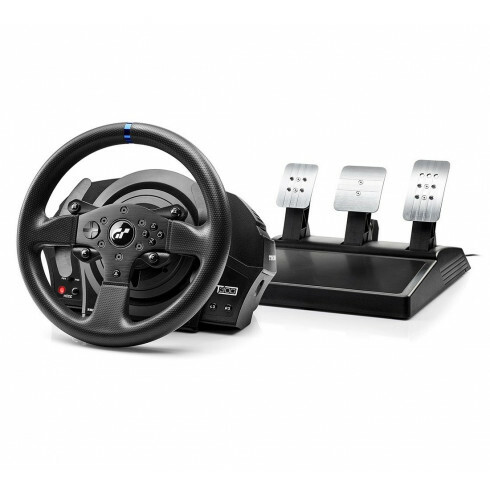 The high-end Thrustmaster T300RS racing simulator set features a 1080° Force Feedback racing wheel featuring an industrial-class brushless motor for super a smooth and seamless Force Feedback effect; an ultra-responsive and realistic Force effect. The 11"/28 cm diameter Gran Turismo style wheel is detachable and is reinforced with a rubber texture on the wheel's entire circumference. This set also features a high quality GT edition pedal set with three adjustable (height and spacing) metal pedals. Thanks to the Thrustmaster Ecosystem, this set also works with all detachable Thrustmaster wheels, the T3PA-PRO pedals and TH8A shifter, so you can upgrade this set for other styles of racing. For the most realistic and fun racing experience, you drive with Thrustmaster T300RS and a Playseat® racing chair! I have used the T300 GT for a few weeks now and it feels great! A real upgrade from my G27. Feedback feels good and the pedals are very realistic. You can feel it's a high quality product and my racing has definitely improved, being a few seconds faster than before. Great wheel and pedals, perfect for my Playseat! GT Sport is going to be awesome! I bought the T300rs GT as a ready to race bundle with the challenge playseat and I couldnt be more happy with my choice. Price based, I saved more than a 100euros ( wheels on greece are a bit overpriced). Other than that what you pay is what you get, a great mid range wheel base and wheel.